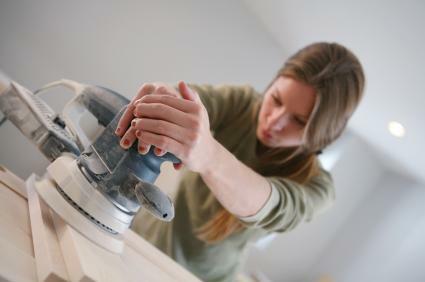 Interior decorating DIY projects let you give your house a facelift while saving some cash. They say if you want a job done right you have to do it yourself, and with interior decorating DIY projects, not only will you save money but you will have the added benefit of knowing the job was done exactly to your specifications. Stop waiting around for workers who never show up and decorators who are more interested in putting their ideas into play than yours - roll up those sleeves and put your design ideas into action! Doing your homework is important no matter if you are a DIY newbie or a weekend project old hand, but it is all the more important if you are just dipping your toes into the DIY pool. The worst thing you can do is to assume that you can wing it as you move through any project. Instead, you want to make sure you know every step will be involved in seeing your decorating project through from start to finish. With this little bit of time spent planning, you won't find yourself halfway through a project without the materials or the know-how you need to move on. Knowing when you are overmatched is equally crucial. If you find yourself thinking, "hmm, how hard could it really be to move that bathroom" or something equally ambitious, take a moment for a reality check. Although there are tons of DIY jobs that are amateur decorator friendly, projects that involve moving appliances that hooked up to your plumbing system or gas line or projects that require extensive electrical wiring work are not for the inexperienced. In other words - not sure which walls are weight bearing walls in your home? Then don't knock any of them down until you solicit a professional opinion. Painting - Painting is an obvious choice for a DIY design project, and for good reason. Slapping a coat of paint on the walls has mega impact in any room and can completely overhaul the design style of the room. Choose a color that enhances the interior design theme of the room, one that creates a certain mood in the room, or one that you just simply love. Wallpapering - Wallpapering can be a little more challenging than painting, but it is a great way to give your room a little va-va-voom (that can be taken down relatively easily when you tire of it). Wallpaper comes in everything from nearly solid colored paper to wild prints and mural like scenes, so have fun! Furniture Facelift - If you're tired of staring at the same old furniture, give it some new life by refinishing it. Staining or painting can both make your furniture look like new. Theme Rooms - Do you have a room that seems to just store "stuff"? Put it to better use by turning into a room that really IS something, like a home theater, home study, kids' playroom, music room, party room with a wet bar - the possibilities are endless. Don't forget to check out our sister site, LTK Home Improvement for more great DIY advice!